Tamper weather resistant GFCI duplex receptacle meets UL/CUL9432016),UL498(2016) requirement.Built with UV stabilized engineered thermoplastic for high cold impact resistance.Features stainless steel straps and mounting screws.Shutter mechanism inside the receptacle blocks access to the contacts unless a 2 prong plug is inserted, helping to ensure foreign objects will be locked out. 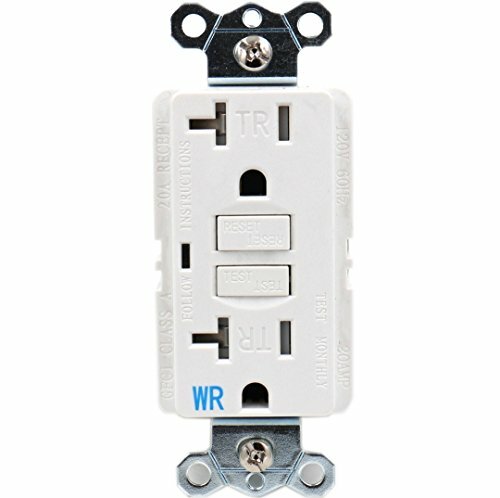 Can be wired to protect all receptacles downstream on the same circuit. Heavy duty construction offers long, trouble free service life. 20A/120V. NEMA 5-20R. UL listed . Meets UL 498 requirements for weather resistant receptacles. Buttons match face color. Covers must be used with WR GFCI receptacles in damp or wet locations per Section 406.8 of the NEC code. Note: The LED indicator light is end of life notification, and it can't indicator when on power.